This metal kayak hanger is an excellent space saving choice for your kayak storage needs. Quality steel construction and versatility ensure that you will be using this piece of equipment for years to come. With the included hardware and security cable (padlock not included) you'll be ready to safely and securely hang any kayak or small watercraft on the wall of your garage, carport, or living room. 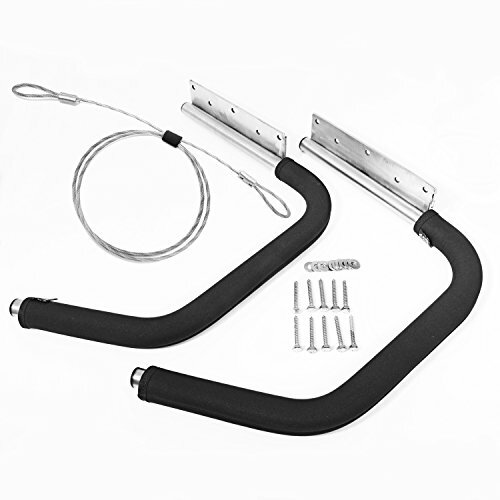 The kit includes two stainless steel arms mounted to wall plates, protective sleeves for the arms to prevent dings and scratches to the boat, a security cable for use with the built in security loop, and 10 screws and washers for mounting the kayak hanger to wall studs. We strongly recommend that you attach the wall plates to wall studs, with the included screws penetrating the wood. This Stainless Steel Kayak Wall Rack With Security Cable is made in the USA, welded by hand, and shipped directly to you from us, the manufacturer.